Heat the oil. Add the mustard seeds and when they pop add the onions, curry leaves and red chillies. Saute until the onions turn translucent. Now add the turmeric and ginger and saute for another minute. 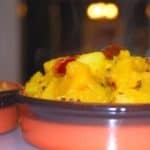 Add the cubed acorn squash, stir to coat with the spices, then add 1/2 cup of water. Bring to a boil, then lower the heat to a simmer, cover with a lid and let it cook about 7-10 minutes or until the squash is fork-tender. Add the cooked, cubed potatoes and stir well together. Add salt to taste. Garnish with some mint or some coriander, if desired.